So I have the A320, B757 and B767....all ultimate versions....and quite like them. Should I be using the "use experimental flight model" in XP11 with these planes? I am on 11.30R2 of XP11. 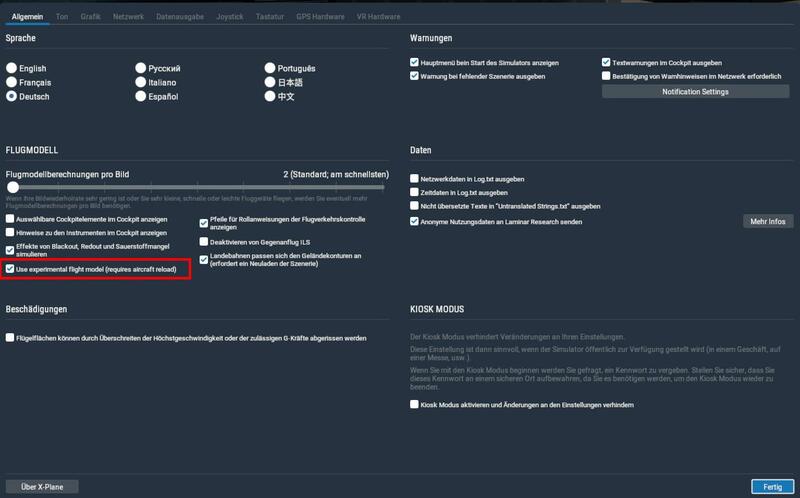 In the German version the option is available in the Allgemein (General??) tab. If I am using ff planes, should this option be ticked on or should I leave turned off. Sorry, I misread your request. Unfortunately, I have no idea. da bin ich mir auch nicht sicher im Moment. Soweit ich weiß hat FlightFactor seine Flugzeuge noch nicht angepasst dafür. Das neue Flight Model ist ja auch noch experimentell.